installers in East Anglia, London, the South East and the West of England. If you are interested in learning more about becoming an approved installer, then please contact us. 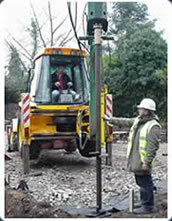 Suppliers of top-quality screw pile foundation systems - rapid installation, environmentally sound, very cost effective. Screw piles provide deep foundations that carry tensile, compressive and lateral loads.